In 2003 Professor Mark Stiles gave a talk on “Beyond Your VLE: Strategic Challenges“. In this guest post he looks back at the talk and concludes that, 13 years later, interoperability is still a major issue in technology-enhance learning. Back in 2003, I gave a plenary talk at IWMW 2003 entitled “Beyond Your VLE: Strategic Challenges”. The use of MLEs can be considered to be fully embedded into an institution when all of the policies, procedures, roles and responsibilities that pertain to the use of an MLE are fully integrated – not just with each other but with those which apply to the institution in its normal practice. 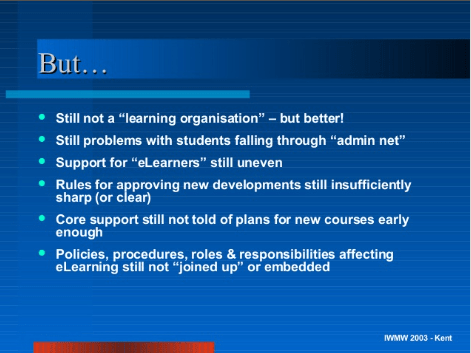 Still not a “learning organisation” – but better! The small list of bullet points above came to define my professorial focus (and I was always interested in pedagogy and how to change that – ah well…). I became very interested in the fact that educational organisations, whilst they frequently produced innovation in the uses of technology in teaching and learning, struggled to sustain innovations and that the organisational aspects of universities and colleges seem almost to guarantee an inevitable drift back towards the status quo. The uses of TEL have indeed grown considerably over the years, with systems not only providing support and enhancements for teaching and learning, but also the management of learning, submission, assessment and feedback and the capture of information at the institutional, course and learner level (analytics) to inform all of this. Nevertheless it is clear that, in most institutions, all of these aspect are not well joined together and do not (largely) effectively pass information between the various systems and tools employed, and that when innovations arise (often in-house) the organisation struggles to successfully spread their use beyond the originators. The use of policy as a tool for embedding TSL following its successful introduction has proved a double-edged tool in that, whilst effective in embedding what has been achieved, it creates barriers to the sustainability of innovation and tensions which might undermine policy itself. This is being exacerbated by the arrival of new technologies and services, which further confuse and weaken organisational control. Those involved in TSL need to examine closely what methods might be employed to enable innovation to be sustained and to question what strategic and policy approaches are needed to avoid blocking both organisational and cultural change. 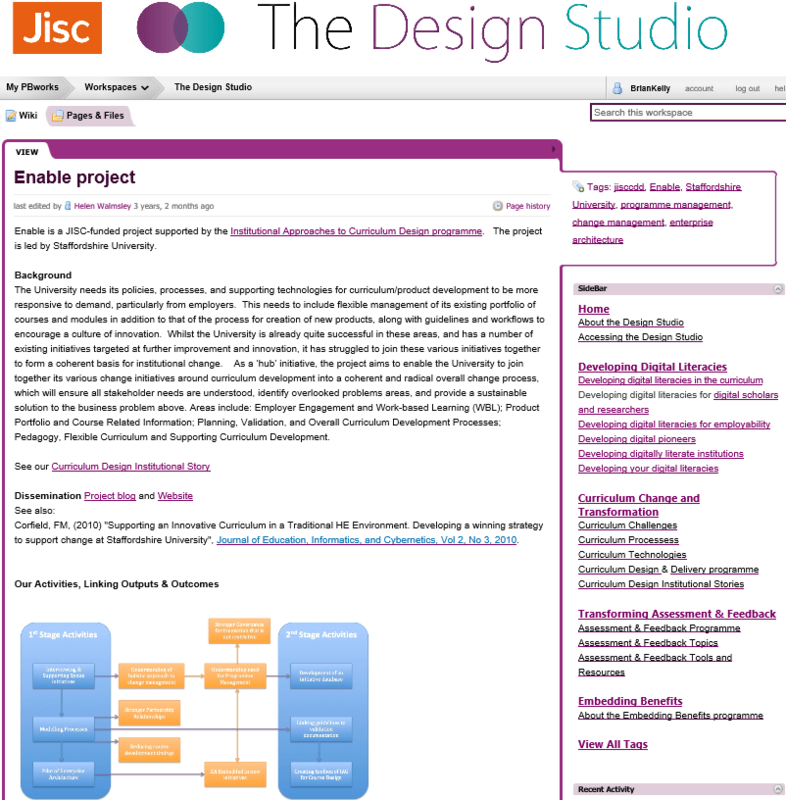 From 2008 -2012 – amongst a lot of other things – I led the “ENABLE” project, which, backed, by substantial JISC funding, aimed at pulling together all change initiatives across Staffordshire University (and its work with partner colleges) that impact on the curriculum design and development process. In working with the change initiatives, the project had two main focuses: firstly the analysis of all current (and changing) processes around curriculum design and development to produce an Enterprise Architecture model of the “as is” state, which could then be used to plan an incremental change path to a desired “to be” model; and secondly the investigation and recommendation of approaches which allow innovation in the institution to be encouraged, but also managed and sustained. The project worked closely with parallel projects at Manchester Metropolitan, Leeds Metropolitan, and Bolton Universities. Questioner: What are some of the top pitfalls that plague IT governance? Peter Weill: The biggest predictor of poor governance and poor performance of their IT was that the senior executive team didn’t understand IT governance. In fact, one of the questions we asked was, “what percentage of your senior executive team, say the top three levels, could accurately describe IT governance?” … In the 250 enterprises we studied, the average was 38%. 38% of senior executives could accurately describe their IT governance. But, if you separate by top and bottom performers and you look at the top performers, say the top third, on a balanced set of financial performance then (for) the top performers, it was well over 50% of senior executives that could describe their IT governance and in the poor performers it was well under 20%. It was 15% and lower. And so that single factor is really important. 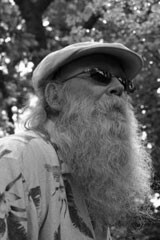 A last point I would mention – having been a member of the Board of Directors of the IMS Global learning technology standards organisation from February 2008 to October 2015 – is that the issues I have described above relating to the governance of information and how institutions are organized have contributed significantly to the situation where, back in 2003, “interoperability” was seen as a major issue in the context of TEL (in terms of systems used for delivery, management and analytics) and, having attended events in the last 12 months, still is. Mark Stiles, Emeritus Professor of Technology Supported Learning, Staffordshire University, has been involved with the use of technology to support learning for around 30 years, and has led research and development work in strategy, policy, systems development and interoperability, and pedagogy. Mark was previously Deputy Chair of the JISC Learning and Teaching committee for some years, Chair of the CETIS (formerly JISC-CETIS) Board and a member of the Board of Directors of IMS Global. Mark’s current interest focuses on the tensions between issues of control and sustaining innovation within organisations in the context of TEL. Mark provides advice and consultancy to UK Higher and Further Education Institutions and related organisations and those running projects in the area of Learning Technology.